For the romantic in all of us Blarney Pilgrim offers the ideal venue for a "Wedding at Sea". The "Traditions of the Ship" add that unique touch to your special day. The ship is "Dressed Over All" with her suit of signal flags. As your family and friends are welcomed aboard, friends of the ship fill the festive air with the sounds of Celtic jigs and reels. 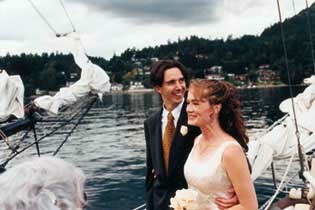 The Wedding Ceremony aboard Blarney Pilgrim also has it's special moments. After rings have been exchanged, Captain Paddy asks the bride and groom to raise their clasped hands. "The Knot" is then dropped over their upraised hands symbolizing their union. When the official documents have been duly signed, the bride and groom sip their first toast from the Ship's Bell. "Set the Ink" on their vows. We will be happy to discuss the many options available to make your special day truly memorable. Tell us about your interests and requirements. Blarney Pilgrim is a non-smoking vessel.